When you purchase Windows from Microsoft Store, you have the option to download an ISO file or compressed files. The Windows USB/DVD Download tool allows you to create a copy of your Windows ISO file on a USB flash drive or a DVD. To create a bootable DVD or USB flash drive, download the ISO file and then run the Windows USB/DVD Download tool. Once this is done, you can install Windows directly from the USB flash drive or DVD. Version 8.00.7600.16385 is a freeware program which does not have restrictions and it's free so it doesn't cost anything. 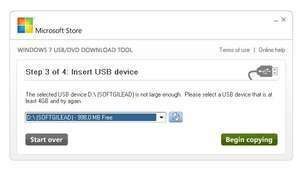 For security reasons, you should also check out the Windows USB/DVD Download Tool download at LO4D.com which includes virus and malware tests. Additional screenshots of this application download may be available, too.